Internal combustion engines are a well-known technology. North American production exceeds 35 million units per year for automobiles, trucks, construction and mining equipment, marine propulsion, lawn care, and a diverse set of power generation applications. A variety of stationary engine products are available for a range of power generation market applications and duty cycles including standby and emergency power, peaking service, intermediate and baseload power, and combined heat and power (CHP). Reciprocating engines are available for power generation applications in sizes ranging from a few kilowatts to over 5 MW. Spark ignition engines for power generation use natural gas as the preferred fuel, although they can be set up to run on propane, gasoline, or landfill gas. Compression ignition engines (often called diesel engines) operate on diesel fuel or heavy oil, or they can be set up to run in a dual-fuel configuration that burns primarily natural gas with a small amount of diesel pilot fuel. 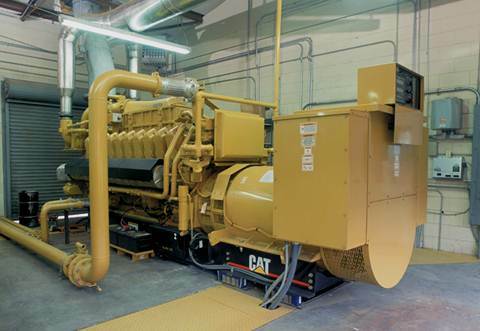 Current generation natural gas engines offer low first cost, fast start-up, proven reliability when properly maintained, excellent load-following characteristics, and significant heat recovery potential. Read more about the different CHP Technologies.